3,5 - 3..........Bingo von Ellendonk. 4,5 - 4..........Jago von Beelen. 4 - 4.............Palma von Ellendonk. 1997: 97-98-95 = 290 points (1st). 1996: 90-94-99 = 283 points (3rd). 1997: 92-94-93 = 279 points (2nd). 1996: 99-95-100 = 294 points (1st). 1995: 98-97-97 = 292 points (1st). 1993: 100-88-92 = 280 points (5th). 30/08/1998: 100-91-94 = 285 points. Körklasse 2 A at two years of age. Overall Build: Medium-strong; dense soft fur; good colour and markings; markings still obvious; masculine, strong head, strong underjaw; eyes dark brown; long and sufficiently firm back; good croup; good angulations; balanced gaiting, back sufficiently firm in motion; good ligament firmness. Nature: Impartial, open and sure. Very high protective instinct and fighting spirit, very high courage and hardness with middle sharpness. Larry von der Mooreiche was the winner of the working IDC World Championship in 1997 with 290 points and the winner of the D.V. Meisterschaft in 1996 with 294 points and in 1995 with 292 points. He also passed the Körung 'for life' with highest possible rating for hardness and working drives (very high for protection, courage, hardness and fighting spirit with middle sharpness). Larry's dam, Cora von der Mooreiche, and her littermates, Castor and Chiela, competed in the D.V. Meisterschaft and also passed the Körung 'for life' with ratings ranging from high to very high with middle sharpness. Castor von der Mooreiche was also show champion. Larry's sire, Ikarus von der Kollau, passed the Körung 'for life' with highest possible rating for hardness and working drives with middle sharpness. Larry lived to 7 years of age (passed away from DCM) while his sire lived to 10 years of age, his dam lived to 12 years of age and his maternal grand-sire, Ali von Langenhorst, lived to 16 years of age. Larry is a half-brother to Gero von der Mooreiche who in turn was runner-up on two occasions at the D.V. Meisterschaft, once in 1991 and again in 1996. 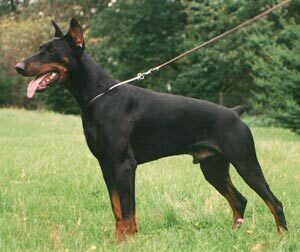 Gero also passed the Körung 'for life', both times with highest possible rating for hardness and working drives and is sire of the von der Doberwache “B, C” litters. Orka: SchH 3, FH and passed the ZTP with 1A rating for character and SG for conformation. He is sire of the vom Hause Anker “A, B” litters.